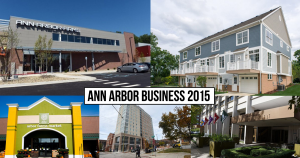 Blue Heron Pond Townhomes of Ann Arbor was named as one of the new construction projects in 2015 shaping Ann Arbor. With the first building of four townhomes completed, the second building is under construction and will be completed late spring 2016. The townhomes, designed by local architect J. Bradley Moore, feature the design and amenities buyers want. Located in an urban setting within walking distance to restaurants, shopping, banking and brew pubs, the community features some surprises. On the corner of W. Liberty Street and S. Maple Road, few expect a secluded pond with mature trees on the 8.39 acre site. The size of the community allows for open spaces and guest parking, things not found in a typical urban setting. The entry lower level of the townhomes has a 2 car tandem garage and a separate entry from the exterior to a mudroom/ storage area with built in cubbies and three large closets. The main floor has a front room with a bay window that could be used as a study, living room or formal dining room. The gourmet eat-in kitchen features granite tops, stainless steel appliances, recessed lighting and a granite bar top that is open to the great room. Great rooms feature a gas fireplace and lead to a private deck. The master suite, second bedroom, secondary bath and laundry room are housed on the second floor. Other interior finishes include custom trim, hardwood, tile and granite. Exterior building construction includes HardiPlank siding, maintenance free decks and brick. The current building under construction adds a third floor to the townhomes with a private loft/bedroom and third full bath. Square footage of the townhomes ranges from 1554 to 1993. There are two townhomes available with immediate occupancy in the first building and two available with lofts in the newest building. There is a fully furnished model to tour Wednesdays-Fridays 12pm-5pm and Saturdays-Sundays 11am-4pm at 2500 W. Liberty St., Ann Arbor.